If you have old double pane windows in your home, at some point, you may have noticed the presence of condensation between the two panes. When you notice this “fogging” effect, the likely culprit is a broken seal along the glass. 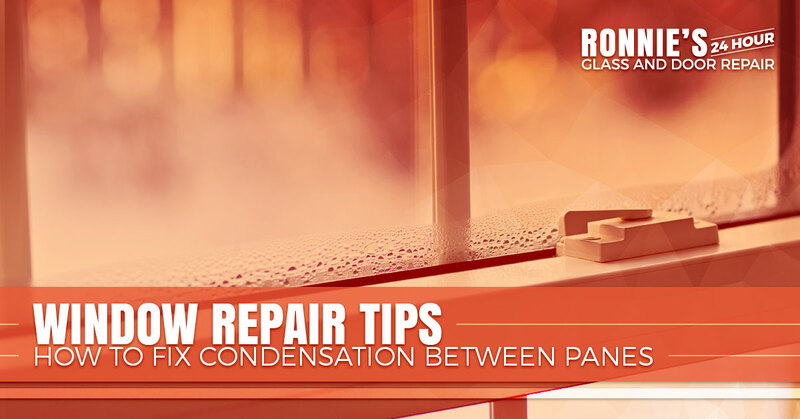 Although this is technically not a completely fixable problem — meaning you likely won’t be able to restore your window to its original condition — you can help prevent condensation from forming in the future. In today’s blog post, Ronnie’s 24-Hour Glass & Door Repair would like to share with you some tips for fixing this problem. If you are in the Fort Worth area and in need of glass or door repairs or replacements, our team can handle it. Not only does our team make a point to respond to calls promptly, but we also are available 24-hours a day, seven days a week. Learn more about us and contact us today to get your free quote. Before we discuss how to fix a common problem with double pane windows, it’s helpful to first discuss how they work. The point of these type of windows is to create an insulating airspace between the glass panels, which then helps to maintain a consistent temperature and prevent heat loss. Most modern double pane windows have two seals — an inside seal that protects against moisture and corrosion and an outer seal that reinforces the strength of the window. These type of windows are known to work quite well and for quite a while in a variety of different climates and weather conditions. However, over time as these seals age, they can wear down, especially when exposed to intense light and moisture. When seal breakage occurs, you will likely begin to see moisture form between the panes. Call a glass repair company to come and replace a single window pane. If they are able to replace just one pane this can save the whole window unit, thereby saving you money. Clean the windows from the inside. This will likely entail drilling holes in the outer pane, cleaning the windows, and then installing one-way air vents to prevent future condensation buildup. In some cases, glass repair professionals can perform a thermal window restoration, which (similar to tip number 2) involves drilling small holes in the corners of the window, spraying various liquid solutions in the inside, sucking these solutions out of the holes, and then sealing and plugging the holes, preventing air and water vapor from escaping or entering. If you notice that your windows are old and rotting, the best solution is to forgo the repair, call your local window company and schedule a new window installation. Fixing your old windows or installing new, quality windows can not only improve the appearance of your home, but it can also enhance the energy efficiency of your home. If you would like a free quote on how much it would be for a new window installation, contact us today. Need The Opinion of Glass Repair Professionals? Call the professionals at Ronnie’s 24-hour Glass & Door Repair! Whether your commercial doors are broken or your home’s windows need to be replaced, we have the knowledge, experience, and equipment to handle it. We even offer 24-hour glass repair. To hire the best glass and door services in the greater Fort Worth area, call us today at 817-349-7835.